* The author blogs at LikeDatOsoCanMeh. As things now stand,our CPF will not be returned to us. Used up for HDB when younger. Used up for EXPENSIVE MEDICALS when older n jobless. PAPple ensure their POLICIES will protect themselves from GRC TO CPF TO FAKE LAWS. In truth,the PAPple will not have to find the money to return our CPF back to us. 70% kena haigong still loving it. Cannot find in another world. How pathetic. In my opinion (not fact – don’t want to get sued). PAP is the ultimate thief, robber, cheat, liar etc. Pretending to be a Saint, Saviour. Then finally shows their true colours. Put in a FAKE news law to ‘SHUT EVERYONE UP’ after taking all their money. And 70% loves them for that. The very important question to ask is whether our CPF money is safe from the government? 1. The government has never tried to maximise the investment return for our CPF. CPF Board, the trustee, has no investment job. Instead, the government uses our CPF money as a cheap source of money. Look around the world. Good large pension funds return 8% long term returns. We get 2.5% or a bit more. The loss of investment return works out to be more than $1 million over a life time for most Singaporeans. The average Singapore workers are are million-dollar taxpayers. Do you know that? 2. The government takes any amount it wants from our CPF money to pay for any “great” schemes it want. Medishield, mediwhatever. 3. The government retains the CPF interest of old folks however it wants. That can work out to be hundreds of thousands of dollars per member. Just work it out. 4. With withdrawal age raised every now and then, and withdrawal amounts at their mercy, many if not most Singaporeans will die with a big CPF account. Is our CPF money safe from the government? That’s why they said u can live to 100 yrs old unable to return u. Another piece of good news of PAP’s bashing. Good news for the 70% supporters. As I observed people are still afraid of PAP including younger ones. This is pathetic as in Dr Chan’s post. There are too many frauds going on and we must be thankful to Phillip Ang for all his posts. He did a fantastic job to whistleblow. Very soon all the white shirts will be cremated and put in Jewel Cemetery for 70% population to pay their respect. rob us blind then shut us up! takes the [email protected]#$*%g biscuit doesnt it? pap clown chairman gic. does he have the ability? NO. that is why 70% sheep needs to pay GST, and more GST, even though gic belongs to 70% sheep. pap clown wife chief temasick. does she have the ability? NO. that is why 70% sheep needs to pay GST, and more GST, though temasick belongs to 70% sheep. pap clown chairman pap PA. WHY? all political parties big or small need S$ to function. the bigger the party the more the S$ is needed. pap PA is parleeement approved source of fund for pap the political party. it is heart of hearts illegal. pap clown knows it but since 70% sheep does not care so the parleeement approved illegal continues. need New Government to review and indict all the abuse of power parleeement approved illegal. once they run road one day, we will be left sucking thumb. only thing here(our cpf) is that we didnt do the investing. as it is several huge gov investments going caput! as it is all over the news gdp slidding ..a sign of economy crisis already happening …but our gov keeps telling us lies that all is good! huh?! From now onwards no one dares to ask is CPF & our Reserves already kosong. Ministers will tell you to shutup, is fake news. And they don’t need to prove it. Just shutup or be sued & lock up. PhilipAng has made an excellent observation. For those who do not know, ALL foreigners/PRs/Work Permits etc. (EXCEPT West Malaysian holding Singapore PRs) who has CPF contributions here, are allowed to withdraw their FULL amounts whenever they leave Sinkiepore for good. E.g.) If an Australian works here for many years, then finally decides to retire home and give up his Spore PR, he/she can withdraw ALL the amounts in his/her CPF, in whatever OA/SA as well as those in Medifunds etc. Therefore, consider this: If ever Sinkiepore economy goes down in a crisis or some major event, and all the FTs run back home, they will definitely withdraw ALL their own CPF funds first; so guess WHO will be the ones left holding the bag? Many such as the 70% with Spineless Sinkie Syndrome (SSS) still do not realize this simple fact. In all ponzi schemes just in like with bank runs or stock market collapses, it is those early birds who are allowed to or fast enough to WITHDRAW all their money first who will be saved. The rest of the Sinkies who are LEEgally blocked from withdrawals will therefore be left with the pathetic leftovers, in the highly improbable case there is actually anything left. Ha! Aiyah they told us orlady, SInkapoo was a Fishing Village before 1965, until Ikan U came ahlong and then hor . . . . 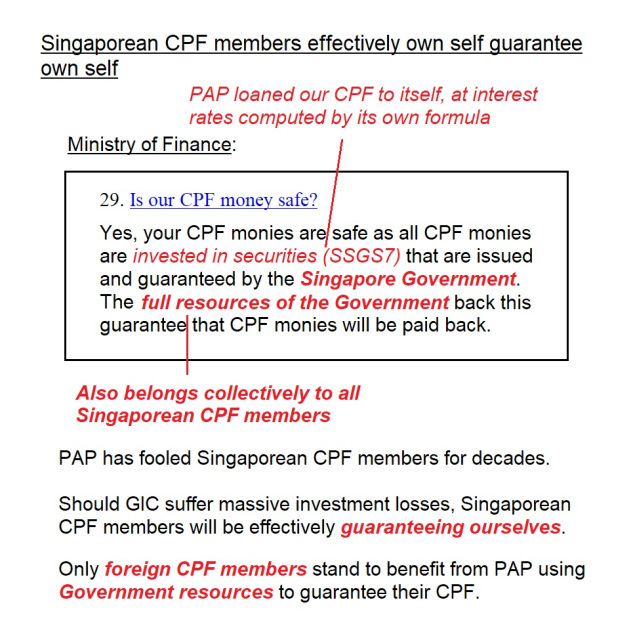 PEASANT AH SENGs HAVE BEEN TOLD THIS – CPF is not your money. Some will get a little mercy by begging, others will get it back via TELEGRAPHIC TRANSFER BY COMBUSTION. Emigrate if you can. You may have to wait for 10 or even 15 yrs to get your cpf money some or all out according to many ex-Singaporeans. They are doing it on purpose to make life difficult for you because they want you to stay and work like slaves for them. They have been losing billions in overseas investments thru Temasek and GIC. Mr Phillip Ang posted alot of such issues here. Now they have an Indian national to take charge of the investments and hopefully Temasek will buyout Indian’s Jet Airways costing $1 Billion. Being egoitics and power hungry will continue to run in this government. More turbulences ahead. These people never learn Confuscius Philosphy. He left 6 books and 1 was lost/not found. My condolences to all Singaporeans esp the DAFT 70% voters. our money also became theirs. Is it like saying Mas Selamat is either dead or he must still be alive? NO. it is written in black and white. RA amount interest goes to CPF pool when person dies. the interest does not go to CPF member beneficiary. YET 70% sheep continues to say what a good deal CPF is in that the interest at 4% is better than commercial bank. 70% sheep does not think. RA amount in commercial bank at 1% is real money for their beneficiary whereas RA amount in CPF is monopoly money which becomes real money in CPF pool when they, 70% sheep CPF members, die. From current experience, pooled money will get bigger and bigger. The pool will quickly be a few billion dollars and eventually be a few hundred billions. The worst is that the pool money will effectively belong to the government, since no end is legally entitled to the pool money. fake INDIAN malay milo: NO. it is written in black and white. RA amount interest goes to CPF pool when person dies. the interest does not go to CPF member beneficiary.